Syracuse coach Jim Boeheim, joined by his wife, Julie, was presented with a jersey for his 900th career win. Jim Boeheim became the third Division 1 men’s coach to reach 900 wins as No. 3 Syracuse beat Detroit, 72-68, Monday night in the Gotham Classic in Syracuse, N.Y.
Boeheim, 68, and in his 37th year at his alma mater, is 900-304 and joined an elite fraternity. Mike Krzyzewski (936) and Bob Knight (902) are the only other men’s Division 1 coaches to win that many games. Detroit Mayor Dave Bing, Boeheim’s college roommate, teammate, and fellow Hall of Famer, and Roosevelt Bouie, a star on Boeheim’s first team in 1976-77, were in the Carrier Dome crowd of 17,902. Midway through the second half, fans were given placards featuring cardboard cutouts of Boeheim’s face with 900 wins printed on the back to celebrate. 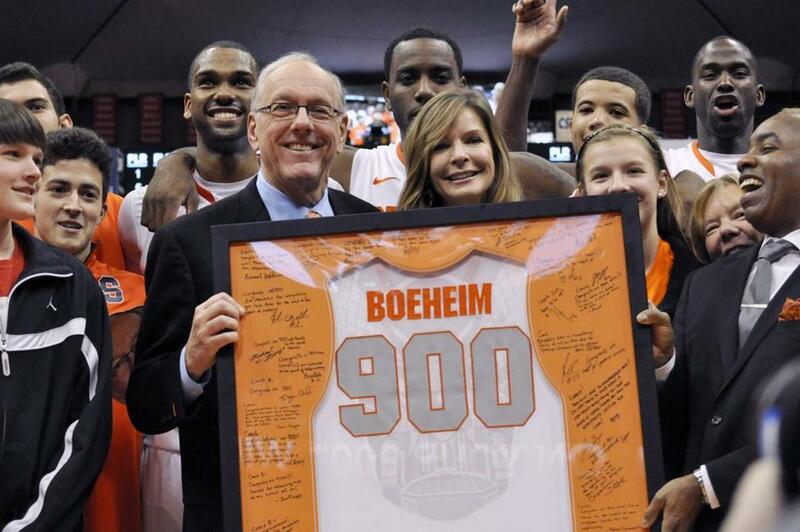 Boeheim was presented a jersey encased in glass with 900 emblazoned on it. James Southerland had 22 points for Syracuse (10-0), which increased its home winning streak to 30 games, longest in the nation. Detroit (6-5) had its four-game winning streak snapped. Orange point guard Michael Carter-Williams, who had 10 or more assists in four straight games and six altogether, finished with 10 assists and 12 points, his sixth straight double-double. Syracuse led, 40-21, at halftime, and was cruising midway through the second half when the public address announcer in the Carrier Dome invited fans to stick around for the postgame celebration. That stoked the Titans to spoil the moment as the game wound down, and they made it worrisome for the hometown crowd. Juwan Howard Jr. scored 11 points to key a 16-0 run, his two free throws pulling Detroit within 67-63 with 55.1 seconds left. But Carter-Williams hit three of four free throws to hold off the Titans. UConn 84, Maryland-Eastern Shore 50 — Freshman Omar Calhoun scored a season-high 22 points and Ryan Boatright had 21 to lead the host Huskies (8-2) to the rout of the Hawks (0-10). Calhoun and Boatright combined to score 15 of UConn’s first 17 points in the second half. UConn went on a 15-0 run, capped by Boatright’s steal and dunk that pushed to lead to 65-33 with 11:44 remaining. It was UConn’s first game since 20 students and six adults were killed last Friday at Sandy Hook Elementary School in Newtown and a pregame ceremony was held to honor their memory. Missouri 102, South Carolina St. 51 — Earnest Ross came off the bench to score 16 points and the 12th-ranked Tigers (9-1) had no problem with the visiting Bulldogs (4-7). UNLV 62, UTEP 60 — Bryce Dejean-Jones led a balanced attack with 12 points, helping the No. 20 Runnin’ Rebels (9-1) hold off the visiting Miners (3-5). Notre Dame 74, IPFW 62 — Pat Connaughton (St. John’s Prep) scored 18 points to lead the No. 22 Fighting Irish (10-1) past the visiting Mastodons (5-7). California 71, Northwestern 65 — Brittany Boyd scored 18 points and Talia Caldwell added 16 as the No. 8 Golden Bears (8-1) pulled away to edge the host Wildcats (6-4). UNH 77, Wagner 54 — Morgan Frame and Cari Reed each scored 14 points and the host Wildcats (5-5) breezed past the Seahawks (1-7). Sacred Heart 55, Manhattan 38 — Kiley Evans and Gabrielle Washington tallied 15 points apiece and the host Pioneers (5-4) shut down the Jaspers.